Do our universities create the political elite? The 2017 UK general election has thrown up many interesting aspects, but if he had been elected, Jeremy Corbyn would have been just the 4th prime minister since 1945 to not be an Oxbridge graduate. In a country of 65 million citizens and over 160 universities, the higher education of British prime ministers’ seems to be moulded by these two institutions of ‘excellence’. Between 1937 and 2012, there were 340 cabinet ministers in the UK, 290 of whom graduated from a university. Of these 290 graduates, 182 were from Oxbridge. In Ireland, in the same period, there were 157 cabinet ministers, 106 of whom graduated university, and of these, 66 were graduates of University College Dublin (UCD) and Trinity College Dublin (TCD). Thus, two universities, in each country, account for almost the exact same percentage of cabinet ministers over three quarters of a century – 62 percent. However, it must be recognised that Britain, with 65 million citizens and 163 universities, is a very different country from Ireland with only 4 million citizens and 21 third level institutions. The most influential university in the UK is Oxford, which accounts for 119 of the 290 university educated British ministers in the period; whilst in Ireland it is UCD, accounting for 54 of the 106 graduates in cabinet. Yet these facts alone, while persuasive, make it difficult to get a real sense of how concentrated an elite’s formation is, especially in international comparison. To help get a better comparative feel we have set out a range of indices that facilitate a direct quantitative comparison of elite formation systems. In examining how elite the university system is in the formation of a societal group, we must capture its influence and exclusivity. The influence of these universities comprises the proportion of cabinet ministers associated with the universities and the limited number, or “fewness”, of the universities. Exclusivity comprises two aspects. First, the more alternatives there are to any one university, the more exclusivity there is. Second, the more unequal the shares of each university, the more exclusivity there is. Eliteness, at the level of each university, is the linked combination of exclusivity and influence aggregated to the level of the system. The indices we have developed produce results that are comparable across institutions, jurisdictions and across time periods. Table 1: Elite indices for the Irish and UK Higher Education (HE) systems supplying cabinet ministers. We found that the university system in the UK that educated cabinet ministers was more elite and more influential than the comparable Irish system over the period 1937-1997 (see Table 1); but this situation was reversed thereafter. This reversal in the period 1997-2012 was largely connected with “New” Labour coming to power in the UK in 1997. Our indices constitute a significant new tool for use in comparative elite studies, bringing a level of transparency and comparability that was absent heretofore. In the case of both countries, the results underline the general view that a few universities dominate when it comes to high political office, these are Oxford in the case of the UK and UCD in Ireland. 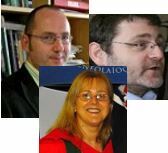 A fuller description of our research, along with details of all calculations and supporting information, can be found in our article ‘Elite formation in the higher education systems of Ireland and the UK: Measuring, comparing and decomposing longitudinal patterns of cabinet members’, forthcoming in the British Educational Research Journal and available through early view. Feeney, S. Hogan, J. and O’Rourke, B. K. (2017). ‘Elite formation in the higher education systems of Ireland and the UK: Measuring, comparing and decomposing longitudinal patterns of cabinet members’, British Educational Research Journal (publication pending). O’Rourke, B. K., Hogan, J. and Donnelly, P. F. (2015). ‘Developing an elite formation index for comparative elite studies: The case of the schooling of Irish and UK cabinet ministers’, Politics, Vol. 35, No. 1, pp. 3-18. Sharon Feeney is Head of Learning Development, College of Business, Dublin Institute of Technology. John Hogan is a Research Fellow at the College of Business, Dublin Institute of Technology. Brendan K. O’Rourke is a College of Business Lecturer and Head of the Business, Society and Sustainability Research Centre at the Dublin Institute of Technology.